Essential Question: How do theories explain scientific occurrences, such as changes of state and heat? examining the development of scientific theories. 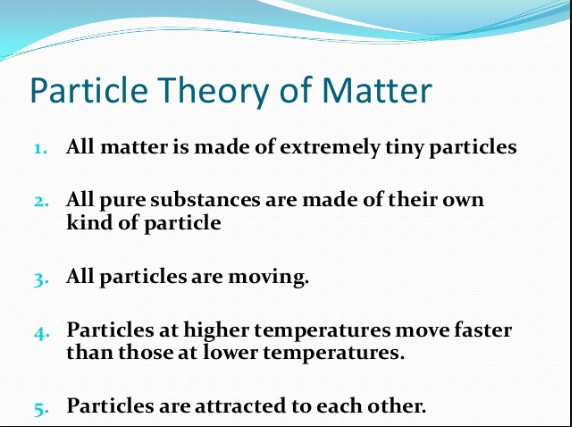 One theory, the particle theory of matter, is investigated in detail. Students use the particle theory to describe changes of state, to differentiate between pure substances and mixtures, and to describe characteristics of solutions. An important distinction is made between heat and temperature. Students demonstrate how heat is transmitted by way of conduction, convection, and radiation. They plan and conduct experiments to identify substances that are good insulators and conductors of heat. They apply this knowledge through the design and construction of a prototype that controls the transfer of heat energy. Students also identify different forms of energy that can be transformed into heat energy, and recognize that heat is the most common by-product of other energy transformations. Students classify substances used in daily life as pure substances, mechanical mixtures, and solutions. They demonstrate different methods of separating the components of mixtures. Students experiment to determine factors that affect solubility.